On Tuesday, May 6, 2014, AOP was asked to be a part of the inaugural 5×10 Talks, an event organized by the Downtown Brooklyn Partnership to showcase innovation in the neighborhood. 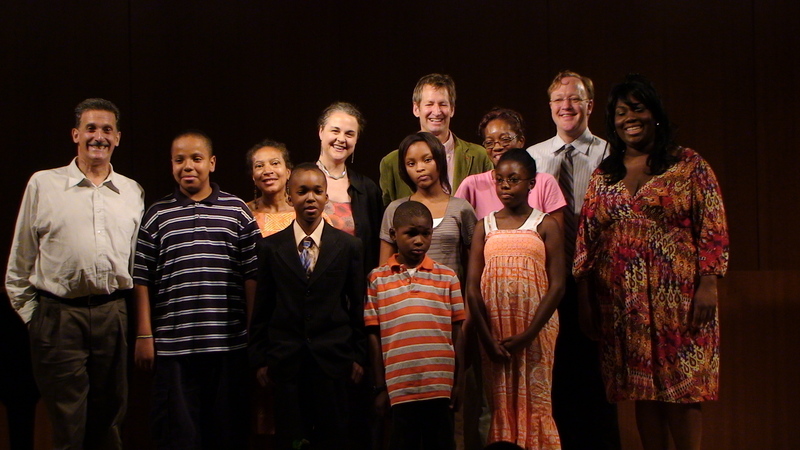 Under their I HEAR AMERICA SINGING program, AOP featured two of composer Gilda Lyons’ songs, rapid transit and “I am From the Ghetto ‘Brooklyn'” (the latter from her cycle Songs from the F Train), and three of their regular performers, soprano Adrienne Danrich, contralto Nicole Mitchell, and pianist Mila Henry. In addition, young poet Najaya Royale read her original text for “I Am From the Ghetto ‘Brooklyn'”, which she wrote when she was only 12 years old. Wanna find out what else is “next”? Watch clips from the entire event here, and check out photos here. And thanks to a partnership with Brooklyn Independent Media, you can watch a SPECIAL BROADCAST of the 5×10 Talks from 6-7:30pm on May 24th, May 25th, May 31st, and June 1st. Tune in on Brooklyn’s Time Warner Cable 756, Verizon FiOS 46 (all five boroughs), and online at BRIC Brooklyn Indie Media. On March 16-17th, Adobe Youth Voices held six workshop sessions on creating music videos and portrait documentaries as part of WNET’s Celebration of Teaching & Learning conference. 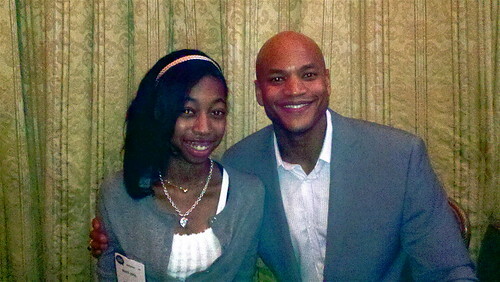 The highlight of the conference was a panel discussion on creating a difference in the lives of young people through education, led by NYTimes best-selling author Wes Moore . And who was one of the participants ? 15 year-old Najaya Royal, who has written poetry for AOP’s I Hear America Singing-commissioned song cycles Songs from the F Train and Brooklyn Cinderella. Najaya’s dream is to combine her writing and musical talents (she also plays the violin and saxophone) into the career of a music journalist. So far, we think she’s done an excellent job. Want to learn more about Najaya’s influences in following her dreams? Click here. Samori Covington, a young poet based in Brooklyn, has already had her work turned into a song, performed by an opera singer, and premiered at Carnegie Hall. And she’s only 12 years old! 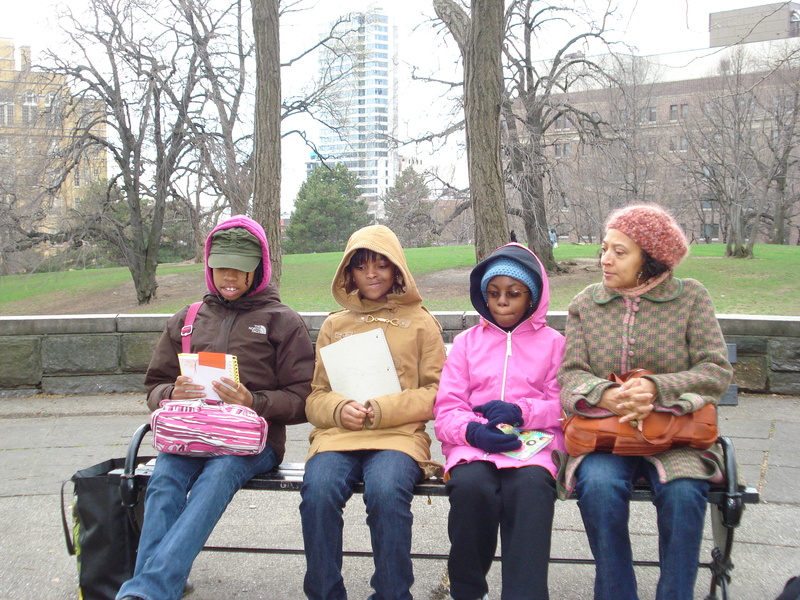 Samori, who wrote the poem “When Randa Wears Red” when she was just 8 years old , was part of the Phat Phun Tuesdays workshop headed by Angeli Rasbury at the Eastern Parkway and New Lots branches of the Brooklyn Public Library, along with two other girls, Alexis Cummings and Najaya Royal. Each girl had one of their poems selected for the I Hear America Singing initiative, founded by Greg Trupiano of The Walt Whitman Project and our very own Executive Director Charles Jarden, which were then turned into the song cycle Songs from the F Train by composer Gilda Lyons. The songs were premiered in the Fort Greene Literary Festival in 2009, although they’ve since been performed at Galapagos Art Space, Cave Canem, and Restoration, not to mention that musical behemoth called Carnegie Hall. Samori’s involvement recently caught the attention of the the online newsletter for Bed-Stuy, Patch.com, which features local news about the Brooklyn region. The Patch article also includes a sound clip of “When Randa wears Red,” featuring mezzo-soprano Nicole Mitchell. 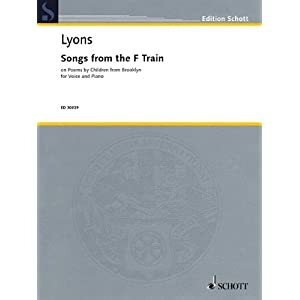 After Songs from the F Train made its initial debut, three more songs were commissioned for Gilda Lyons, and her follow-up cycle, Songs from the A Train, made its debut as well. In fact, the initiative has been so successful that AOP and The Walt Whitman Project will commission another three songs through Angeli’s Phat Phun Tuesdays, with performances scheduled for this June in Fort Greene Park. But is Samori phased by all this well-deserved success? Not one bit. She admittedly still uses a script when she reads her poem aloud. Though she does want to be a writer when she grows up. Or a pediatrician. Or a scientist. On a hot summer morning, the Brooklyn Library’s Dweck Auditorium is filled with children (along with their parents and a few other adults) craning their necks to watch five of their fellow students, one by one, take the stage and recite poetry. Not just any poetry, but their own. Poetry that talked about loving Brooklyn, about hating Brooklyn, about being shy, about being ambitious, about looking good in a dress, about living large in a mansion. Moments after these five students, ranging in ages from 6 to 13, had finished reading – some shyly, some proudly, all bravely – they took their seats and all watched as mezzo-soprano Nicole Mitchell and pianist Kelly Horsted walked on the stage. A few seconds later they heard the poetry again, this time expressed in powerful song. This was I Hear America Singing, the initiative by American Opera Projects and the Walt Whitman Project to transform the words of ordinary Americans into opera, and its first two song cycles composed by Gilda Lyons – “Songs from the F Train,” premiered in June 2009, and “Songs from the A Train,” premiered on this summer morning July 19, 2010 at the Dweck Auditorium, with all but one of the six young poets in attendance. Later, their writing mentor Angeli Rasbury asked the students to express themselves yet again, but this time with a focus on what they felt when they heard Ms. Mitchell, a Brooklyn native herself, sing. When I hear Nicole Mitchell sing, I hear a talented opera voice in my ears. I feel very happy to hear her beautiful voice singing, letting all her emotions out. I hear and see the birds flying high. I hear the crickets singing and the butterfly flying joyfully through the sky. When I hear Nicole Mitchell I look back in the days when black people were slaves singing and working hard to get their freedom. I imagine Nicole back there in time singing to her freedom, singing when will she be free. When I hear that song it makes me feel proud of black people, of how far we have come, to this stage right now. When I hear people like Nicole Mitchell, my day keeps getting better and better. When I hear Nicole Mitchell sing, I feel happy and think I’m in heaven. I hear trees whistling in the breeze. When I hear Nicole Mitchell, I can imagine different colored flowers moving slowly from side to side. When I hear Nicole Mitchell sing, I am joyful. I feel like a red leaf. When I hear Nicole Mitchell sing, I feel like I am in beautiful, lush Barbados. I feel Nicole Mitchell is a beautiful singer. When I hear Nicole Mitchell sing, she sounds excited to be alive. When I hear Nicole Mitchell sing, I feel free. When I hear Nicole Mitchell sing, I feel like a pretty slave who has been freed. that my people is pure music! This is only the beginning of I Hear America Singing. In the 2010-11 season AOP will branch out with new performances and new songs. There are many voices yet to be heard. 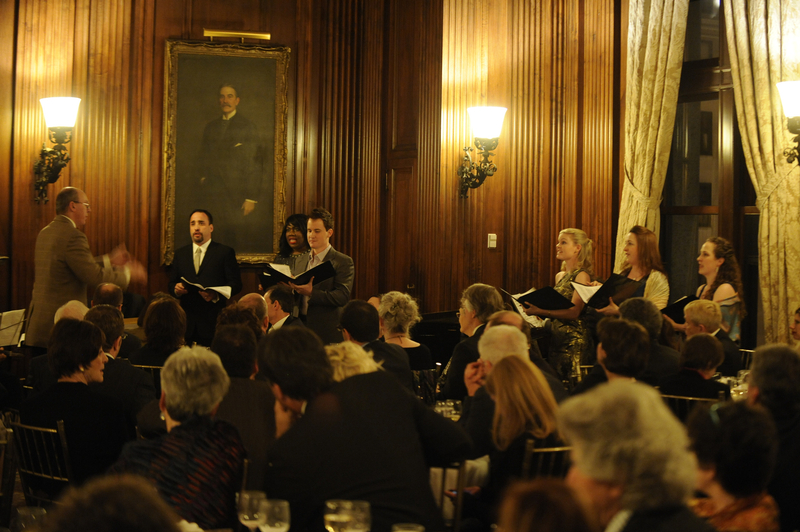 Visit www.operaprojects.org throughout the year to discover when and where to hear them. DUMBO – The opera is coming to town, but in this case you won’t need binoculars, tuxedos or even an expensive ticket to get in. “Opera Grows in Brooklyn” will have its second installment at the Galapagos Art Center in DUMBO tomorrow, presented by American Opera Projects (AOP) and Opera on Tap.